In 2011, it was Netflix. In 2012, it was JC Penney. And in 2013, could it be Celiac Supplies? What does Brisbane’s only gluten-free and wheat-free retailer have in common with these two US companies? All three companies have executed pricing strategies that have divided the pricing community, the media and their customers. Netflix decided to replace one bundled (DVD and online streaming) subscription, with two separate subscriptions for each service, resulting in, amongst other results, 84,000 hostile comments on its Facebook page within a week. JC Penney decided to do away with its frequent sales and its couponing strategy, replacing it with everyday “fair and square” pricing…and turning customers off in the process. As I write this, the instigator of this strategy, CEO Ron Johnson, has just been replaced by former chief, Mike Ullman. And as has been widely reported around the world (a quick search of Google News finds stories appearing in Alaska, Indonesia, Greece, Hungary, France and China, to name a few), Celiac Supplies recently decided to charge customers $5 to browse its store. 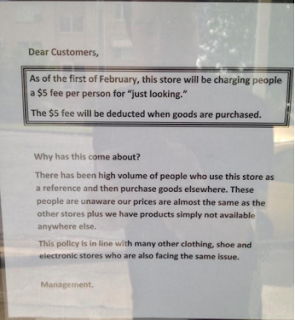 This initiative was in response to the practice of “showrooming”, where customers browse in-store but then go and buy online, often at cheaper prices. People from many walks of life think this is a really bad move that will hurt Celiac’s business. 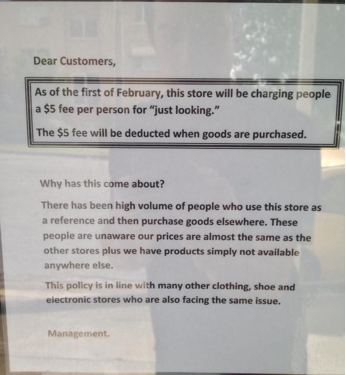 How can a retailer possibly charge a customer for something that has previously been provided for free? But I believe this initiative might be “one step backwards for Celiac, and two steps forward for retailers”. Any student of marketing knows that products have a lifecycle. Pricing models, strategies and tactics have life cycles too. They evolve over time, as they move through a series of iterations before being perfected. Pay-to-Browse is one early iteration and component on the road to a new retail model. A similar process is currently underway with online pay walls, but it has already happened in other industries. Remember Bryan Grey and Compass Mark I? The airline charged every single passenger on a flight the same price, a lesson that was learned by subsequent low cost airlines. Similarly, airline frequent flyer programs have been refined over the years, overcoming previous shortcoming (no recognition of contingent liabilities) to the point where some airlines’ frequent flyer programs are more valuable than the airlines themselves. Pay-as-You-Drive (PAYD) car insurance is a pricing strategy that is also getting its kinks ironed out. Norwich Union in the UK removed their offering in 2008, but the AA launched a policy in 2012 that over came its limitations. I like the courage Celiac has taken. After all, Lemmings don’t innovate. Celiac Supplies’ Pay-to-Browse fee may fail: such a charge will stick when retailers have real value to monetise, and do so from Day 1. It is always difficult to charge for something that has previously been provided for free. But people do pay to drive on roads that were previously “free”, and banks do charge for their product, rather than relying on making their margin on the difference between borrowing and lending rates of interest. One day, paying to browse may also succeed.